Introducing the next generation in the Kr808 e cigarette category. The new Kr808 clearomizer kit is the latest in the market using a kr808 clearomizer for easy refills. In the kit are two Manual/Automatic batteries 280mAh which works great for users that like a small device and long vaping. The clearomizer technology for the Kr808 e cigarette is the newest on the market and has No leaks and No burnt taste. 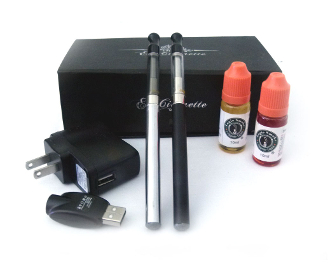 It is equipped with a bottom coil for better use and a drip tip, making it easy to refill. To refill your Kr808 clearomizer simply unscrew the top and fill using the e liquid bottle. To fill the Kr808 clearomizer tilt it on it's side and avoid getting liquid in the center part.